Fruit of an instance of SCP-3399-1 at site of original discovery. Special Containment Procedures: SCP-3399 is to be stored in a standard secure storage locker. Protective gloves should be worn when handling to prevent accidental activation. One instance of SCP-3399-1 is to be maintained in the botanical wing of Site-██. Additional instances may be grown for research purposes at the discretion of the Senior Researcher. Description: SCP-3399 is a replica of the fruit from the Platanus orientalis (oriental plane) tree made primarily of gold and decorated with silver, the spines of which are sharp enough to penetrate human skin on contact. When exposed to human blood, SCP-3399 will split along the lateral axis into two separate pieces connected with a hinge; opening SCP-3399 in this state reveals a single seed superficially similar to those from the Platanus orientalis. When planted, this seed will grow into an instance of SCP-3399-1. SCP-3399-1 is a tree superficially resembling the Platanus orientalis that typically grows at an accelerated rate, reaching full maturity in approximately three months. As SCP-3399-1 grows the leaves of the tree begin displaying images representing the memories of the individual whose blood originally opened SCP-3399 (henceforth referred to as the donor), rendered in a realistic style and shown from the point of view of the donor. These images are slightly translucent and superimposed over the surface of the leaf. Tests show that the images are accurate representations of events from the life of the donor as they recall them. Each leaf displays a single image, which remains unchanging for the duration of its life. As the new instance of SCP-3399-1 grows it will begin to show images from the life of the potential offspring of the donor and the partner displayed in the leaves of the original SCP-3399-1 instance.3 The new instance of SCP-3399-1 will ultimately begin producing seeds itself, which when planted grow into further instances of SCP-3399-1 displaying images of the potential offspring of the hypothetical individual displayed in the parent instance. The health of a given instance of SCP-3399-1 is determined by the genetic viability of the individual it is linked to - either the original donor or their hypothetical offspring. The presence of any genetic disorders in the displayed individual will cause SCP-3399-1 to grow in a non-standard manner, typically showing visible defects or abnormalities. See table 3399-1 for a list of observed abnormalities. SCP-3399 was discovered in an isolated valley in [REDACTED], inside a shrine of Daevite origin; the style and decoration of the shrine was consistent with that found in structures related to the Daevite royal line. Also found in the shrine were numerous sealed scroll cases; partial translation of the scrolls sealed within reveal them to be detailed genealogical logs of a number of Daevite families, along with descriptions of desired future pairings. The shrine was surrounded by 73 instances of SCP-3399-1, with the images displayed on the leaves of SCP-3399-1 matching the style of dress and cultural surroundings believed to be associated with Daevite royalty. One instance of SCP-3399-1 was transported to the botanical wing of Site-██; the rest were destroyed following the collection and cataloguing of seeds from each specimen. Notable abnormal growth patterns observed in SCP-3399-1 instances during testing. D-5321 Confirmed to carry the gene for cystic fibrosis. In 25% of planted instances, tree bark was noticeably paler than in healthy instances, and leaves were dry and brittle. Results imply that the displayed partner is also a carrier. Researcher C██████ Statistically significant family history of myopia. Images displayed on the leaves were largely indecipherable, typically being little more than coloured smears. D-88432 Infertile due to prior treatment for cancer. Instances of SCP-3399-1 grew normally, but never began producing seeds. Second generation seed. Researcher M███ was donor for the original instance. None 50% of planted instances were stunted, never reaching more than half of the height of a typical instance, and branches held significantly fewer leaves. Later testing revealed that the displayed partner, confirmed to be Researcher M███s husband, possessed the gene for Huntington's Disease. D-75332 Family history shows a statistically significant resistance to bacterial infections. SCP-3399-1 grew approximately 10% larger than observed averages in height and girth. Surface area of leaves was approximately 15% above average. During destruction of the instance, the wood was observed to be notably harder to cut than standard instances. D-5411 Tested positive for a number of genetic cancer markers. Each instance of SCP-3399-1 grew with a crooked trunk and branches, and developed a significant number of knots and burls during growth. Leaves were notably yellow in colour. Addendum 1: Following the planting of a seed from an instance of SCP-3399-1 of which Researcher L█████ was the original donor, the leaves on SCP-3399-1 began displaying images implying a relationship between Researchers L█████ and P███████. Researcher L█████ was married to a non-Foundation civilian at the time. Approximately one year later, Researchers L█████ and P███████ informed the Foundation Human Resources department that they were beginning a relationship following Researcher L█████'s divorce, as per employee fraternisation guidelines. Addendum 2: Approximately six years after the birth of the first child of Researchers L█████ and P███████, it was determined that the images displayed by the secondary instance of SCP-3399-1 match those of the child with a 96% certainty. In an attempt to determine the nature of the predictions made by SCP-3399-1, Researchers L█████ and P███████ have agreed to bring their child to Site-██ periodically to try and influence the images displayed. Checks for images relating to Site-██ are ongoing. Addendum 3: Attempts to grow seeds from the instance of SCP-3399-1 displaying the child of Researchers L█████ and P███████ have all failed; the seed grows normally for approximately a week before it spontaneously suffers from rapid cellular decay. The reason for this is currently unknown. 1. 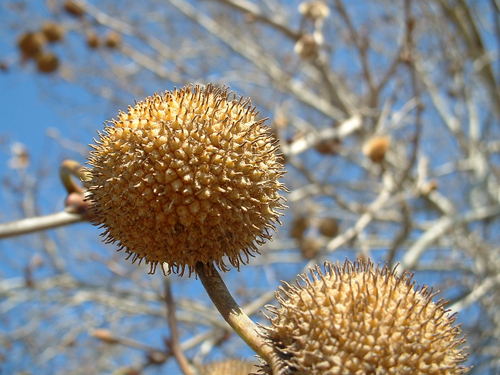 Fruit of the Platanus orientalis is non-edible, in both anomalous and non-anomalous varieties. 2. In approximately 84% of observed cases. 3. Foundation geneticists assigned to SCP-3399 agree that the displayed individuals could be offspring of the donor and hypothetical partner, with a certainty of 98%, based on the observation of visibly expressed genetic traits.